Between Gluten Free Pancakes, The 30 Day Shred and the Pure Protein you'd be forgiven for thinking this blog had turned into one run by a clean eating perk type whose idea of a good time is getting up at 5am to go for a 7 mile run. Well, it's not. Sorry if I mislead you. I'm not a clean eater, I prefer every day to come with a healthy dose of cynicism and sarcasm and my idea of a fun time is sleeping till noon then hitting the shops for some retail therapy - and popping in to one of the many restaurants that nestle in between those shops when my feet get tired or my tummy starts to rumble. Bread Meats Bread is one of those restaurants - located in the city centre of Glasgow and serving up some of the best burgers in town. I've been a few times now and have tried both the cheeseburger and the bacon cheeseburger and can definitely vouch for them. The burgers are good - you're asked how you want them cooked when you arrive - the buns are just the right side of squidgy and I can't find a fault to them. The thicker cut chips in the photo are just the normal 'chips', and they've okay but nothing special. 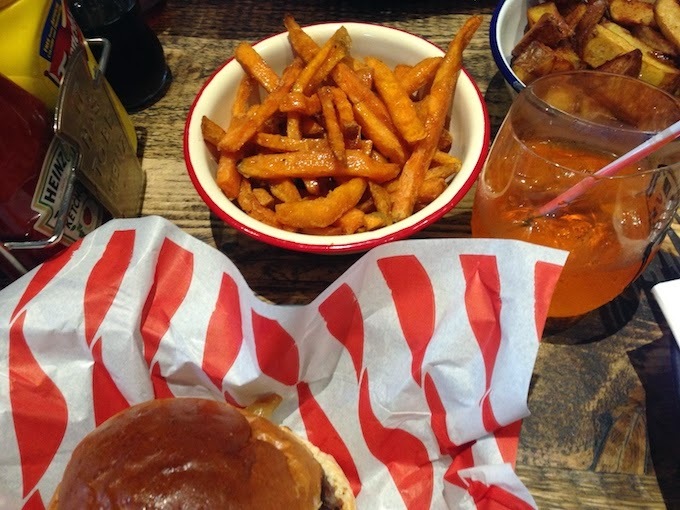 On my first visit I ordered the sweet potato fries, which were again decent but, you know, not distracting from the burger. On my second visit though I ordered the caramelised sweet potato fries and, well, my world has changed. Yep, that it exactly how good these fries are. Caramelised sweet potato fries are exactly that - sweet potato fries drizzled with a caramel-y, golden syrup-y sauce and it sounds like the strangest combination but just trust me - you need to get yourself a plate of these fries in your life. These fries are The Best Fries In The World. And yes, I fully appreciate how big a statement that is, but it's one I'm prepared to stand by. They are the most decadent oh-so-wrong-but-oh-so-right pairing of potatoes and sauce that has ever graced my lips.I've ordered them every time I've been recently and nothing can pry me away from my choice, even though I usually hate to get stuck in a routine when the routine tastes like this there's no need to break it. Next time I'm going to switch it up by going for a hot dog to accompany them. On my latest visit one of my girlfriends ordered the bacon chips and after tasting them I can confirm that they're also a brilliant choice, though I stand by mine. Best thing to do is order one of each and share, they're massive portions and one between two would definitely suffice but when side orders are this good you've just got to get greedy. If you did practise some restraint and order one between two (well done, you're a stronger person than me) you might have room left for dessert - to which the choice I would go for is this smashed brownies and ice cream combo. I only had one tiny bite because, quite frankly, it wasn't my dessert and if I'd had more I would have probably brought all those delicious fries back up in a way that would leave me far too embarrassed to ever be able to return and I just couldn't risk it. You probably know my verdict here but overall I can't recommend Bread Meats Bread enough - the staff are friendly and knowledgable, the menu is broad enough for choice without being overwhelming and the burgers are excellent. But come on, you all know it's the fries I'm going back for. If you have dietary requirements don't let it hold you back, on my most recent visit one of our group had a gluten intolerance and was able to get a burger without a bun and with a few extras to make it suitable for her so they are greta about accommodating things like that and fully able to answer any questions. It's a first come first served basis so go as 'off peak' as you can and be prepared to wait - but it's worth it. You can find Bread Meats Bread at 104 St Vincent Street and their website at breadmeatsbread.co.uk - though it appears to be down at the time of writing this. This sounds absolutely amazing. I really do need to go.